Black Canyon 100k is NOT a course to be taken lately. It’s technical and hot. Like really hot. And the only shade you’re going to get is if you’re lucky enough to cross a cactus tall enough to shade your ankles… for the few hours that shade actually exists. Even though I decided to end my race at mile 38, I’d run the entire course in training. I knew that the last 24 miles was going to be extremely rough. Even though the course has an overall negative drop, there are very few sections of open downhill. There also aren’t a lot of straight sections of course either. Really, it’s very fair course in terms of running strengths. It boils down to who manages heat well, who sticks a good race plan and who is the most well rounded runner. The race morning was beautiful and I was as well put together as I could be. I was ready to run with this amazing level of talent. I knew I belonged there and wanted so badly to be able to have a good day racing, something I haven’t done in handful of months and was missing quite a bit. The field of talented front runners packed up against the line, introducing ourselves and sharing some laughs before the inevitable heat transformed us all into angry and exhausted zombies pushing towards the finish. Jamil gave us a couple directions, I closed my eyes and prayed for safety for all runners, adjusted my gear, and started my day. First was a 400 meter shot around a dirt track and then through the small town of Meyer, AZ onto the course. There were two runners who went out hard, one being Altra teammate Jake Puzey. I knew his long stride and fast cadence would shoot him up front on the easy fire roads. I wanted so bad for him to be able to take the lead and make an entrance into the upper echelon of the sport, where he’s so capable of being. I wished him luck as he bolted off. I quickly sunk into a comfortable pace in the chase pack with Brian Tinder, Ryan Ghelfi, Catlow Shipek, Dave Mackey, eventual winner Ford Smith, Chris Price, Hal Koerner and a couple others whom I heard running but never glanced to see who they were. Ghelfi shot for the lead as we narrowed in on the rolling single track and slowed the pace down to something more realistic, considering we were on pace for a 7½ hour 100k. We chatted and had some good laughs for a couple miles until Dave Mackey broke the pack and made his move towards the front. No one wanted to break after him but the general pace of the group picked up a little as we settled into the gradual down hills towards the first aid station. Enveloped with the beauty of the course, miles were just clicking by. Somewhere along this section, around mile 6 or so, we opened onto an ATV track and all had the opportunity to bunch back up and chat. I’m not sure how it happened, but I remember my back leg getting caught with someone else’s front kick. It wasn’t enough to send me flying, but I instinctually stumbled forward to catch myself. I extended my right leg out in front of me and felt a little pop and sharp pain in my hip. I was instantly concerned but the pain faded quickly with each step and I shook it off, figuring it would be fine to work through. We all came into the aid pretty close together feeling great. I had Caitlin there to drop a 1L bladder into my Ultraspire Spry vest and 16oz bottle up front full of ice water to keep the body cool. 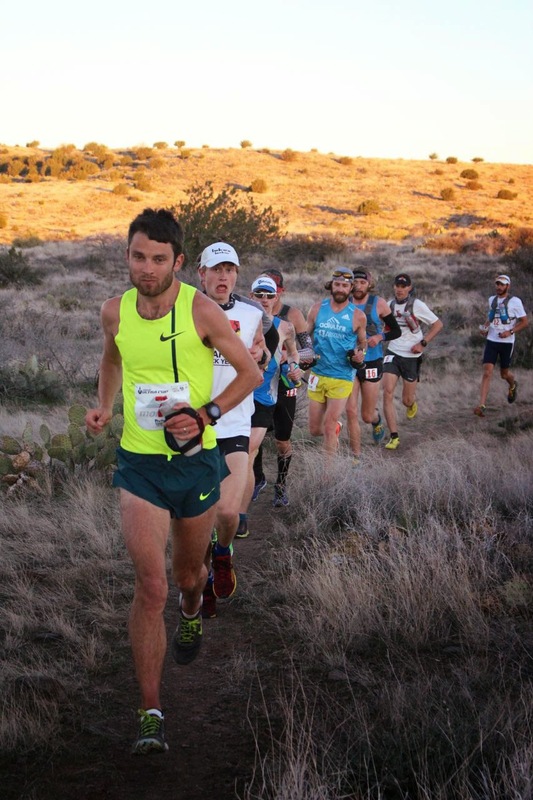 We weren’t more than an hour into the sunrise and the Arizona desert started to heat up… along with the race. There was something about coming out of that first aid that flipped a more serious switch. The laughs became less and focus started becoming more intense. I was sitting in 4th for a majority of the first section and back in 5th or so for the second section. I know I came into the 2nd aid station with a couple leapfrogs back and forth with Chris Price and Brian Tinder, but still near the front of the chase pack. I had enough nutrition and hydration for the next section on me so literally just ran straight through and onto the next section while I noticed a couple others filling bottles and getting supplies. This is the section that things started heading down hill. Literally and figuratively. The pain in the hip started to increase as we turned onto the Black Canyon Trail and started the myriad of ins and outs with little ups and downs, sharp turns and little dips in the trail. Unfortunately, all the stability I required of my hip hitting those turns, climbs and dips really started to wear on it. Around mile 18 I was struggling to maintain form on the down hill section into the aid station. That’s a huge problem considering technical down hill is normally my strong suit. It was hard to watch the front runners slip away and I thought I might be able to turn it around, but it was apparent while attacking the climb after the 3rd aid station that the compensation was starting to travel through the kinetic chain and affecting my glutes and climbing muscles. I was forced to take even little climbs at a hike. Around mile 26 I was fortunate enough to run into Kaci Lickteig, a phenomenal athlete and someone I look up to quite a bit as a runner. I latched on behind her and we started chatting away in hopes of distracting myself. We were actually able to put down a couple miles when she let me know that she was starting to struggle with an old injury too. Being a PT, her and I had a pretty good understanding of the human body and had a little fun evaluating each other’s gait while gimping along. We both knew the inevitable was going to happen but we needed each other to help realize that it was the best decision to make. Once we accepted it, the competitive nature subsided and we joked, sang, hobbled, ate cookies, laughed, suffered and worked each other through the next 12 miles to Black Canyon Aid Station where we decided to share our first DNF experiences together. The Pixie Ninja herself, Kaci Lickteig, helping others after she called off her own day. We hobbled around the aid station, helping care for other runners and cheering them on. I was happy to help others finish what we started out to do. And Black Canyon Aid was definitely more like a MASH unit than an aid station. Runners poured in completely ravaged by the heat. Kaci even was able to use her PT knowledge to help a dear friend and local badass, Carol, carry on with her day. I always thought of myself as someone who would gut out a finish no matter what and never DNF, and I probably would have in this instance without someone to help me realize the foolishness in that mentality. It was the right decision and I knew it was going to help salvage the rest of my race year and keep me running happy. And as crazy as it sounds, Kaci and I actually turned what could have easily been a terrible stretch of desert heat and unforgiving miles on an already defeated body into something that ended up being one of the best running memories I’ll probably ever have. I’ve come to the conclusion that accepting a DNF is like putting down the family pet. It’s only a matter time and even though it’s the right decision to make, it doesn’t take the sting out of it. Kaci said something to me that really stuck though, she reminded me that we do this for fun and not as a job. The second we stopped having fun competing, we needed to back off so we didn’t lose the love of the sport and competition. And don’t ever let the ego decide what’s best for the body, it doesn’t care about anyone but itself. The Black Canyon 100k course itself was amazing and challenging. I felt ready and wanted to compete so badly, but I guess that will have to wait for another day. Now it’s time to get healed up and start to plan out the rest of the season. My sponsors mean everything to me. Especially the biggest sponsor, my lovely wife who used Valentine’s Day to show me how much she loves and supports me by crewing me all day. I guess I really owe her after this one. Wherever I go from here, I hope to see you out there on the trails, having fun and enjoying #milesofsmiles.